Turning on your computer and having it not start is one of the worst experiences computer users can have. It is often mysterious and you are given little information as to what is wrong. Usually a cryptic blue screen error, a one line error like “Operating System Missing” or nothing at all. Just a blank screen that never does anything or just keeps restarting on its own in an endless loop. Every week I fix unbootable XP computers. Even though the XP operating system has been off the market for years, it is still almost as common for me to repair as Windows 7 computers. A lot of times when I do remote repairs (by phone, email or my private discussion board) the user does not have an XP disc and this complicates things further for them. Many laptops never came with an XP disc and often the user hasn’t needed the disc for years and if they had one, they have no idea where it may be stored. Here are the errors I see most often and some tips on how to repair them. 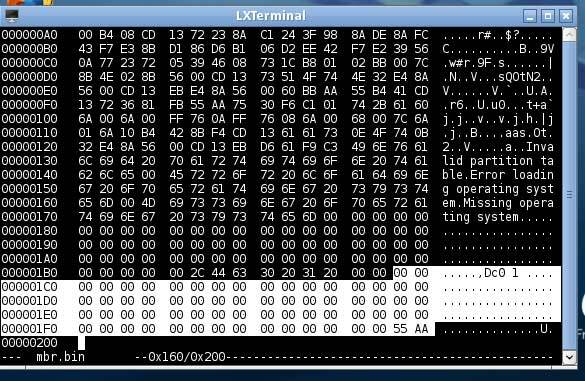 We will be looking at Windows XP 32-bit using NTFS for the filesystem. When you turn on the computer, its CPU begins to carry out the programming instructions contained in the basic input/output system (BIOS). The BIOS contains the code that starts the computer regardless of the operating system installed. The first set of startup instructions is the Power On Self Test (POST). The POST gets the computer ready for loading the operating system. After the motherboard POST completes, add-on adapters that have their own firmware (for example, video and hard drive controllers) carry out internal diagnostic tests. When disconnecting or checking the hard drive connections, always make sure the computer is unplugged and has no power (hold down the power button for a few moments to drain any stored power after unplugging). Also, you should be grounded with a wrist strap or take other precautions not to shock anything with static electricity. Start the computer and go into the BIOS settings. There should be instructions for how to do this as soon as the computer starts. Like, “Press F2 to enter system settings“. In the BIOS look and see if your hard drive is listed. If it is not, then we need to find out why. If it is listed then make sure that it is also listed as a boot device in the Boot Order section of the BIOS (search online for a manual that is specific to your model for the exact settings location in your BIOS). If everything looks okay in the BIOS then see if your computer has built in diagnostics. Many brand name computers like Dell, HP and Compaq do. Consult the manual for your computer for details. If it passes the diagnostics then move on to checking the MBR later in this post. If you find a problem in the BIOS then you need to check the physical connections of the hard drive. Unplug the power cable and hold down the power button for a few moments to drain any stored power after unplugging. I have seen the ribbon cable go bad on many IDE hard drives. The easist way to check it is to replace it with a new one or one that you know is good. Check that the power MOLEX connector is plugged into the drive tightly. Check that the ribbon cable is properly seated in the Primary IDE socket on the motherboard. Check that the ribbon cable is properly seated in the socket on the hard drive. Make sure that the jumpers are set properly so that the boot drive is set as the Primary Master and anything else connected to the cable is set to Primary Slave. If using Cable Select, make sure the jumpers on the drive are set correctly and that the boot drive is plugged into the Master plug on the ribbon cable (the end plug on an 80 conductor cable or the middle plug on a 40 conductor cable). Check the BIOS again to see if the drive is now properly detected. Check that the power and data cables are properly seated in the drive and motherboard. Unplug the power cable, and remove the battery first before removing the Hard Drive. Remove any thing else plugged into the laptop. Pull out the hard drive and carefully reseat it. If you still get the error at this point, it is probably a serious problem with the drive itself. See if it is detected in a different computer. You can see some of my other blog posts on data recovery for instructions on doing this. When you start a computer from the hard drive, the BIOS identifies the startup drive and reads the master boot record (MBR). The MBR is always located at the first sector so the BIOS can find it. It contains a small program called the master boot code that the BIOS loads into memory and begins to run. The master boot code is often the same on XP systems but the partition table is changed based on the specifics of your setup. It is also often changed by malware. When the ‘Welcome to Setup’ screen appears, press the R button on your keyboard to start the Recovery Console. The Recovery Console will start. If you have multiple Windows installations, it will list them, and you enter the number associated with the installation you want to work on and press enter. If you have just one Windows installation, type 1 and press enter. You will then be prompted for the Administrator’s password. If there is no password, press enter. Otherwise type in the password and then press enter. You will now see a C:\Windows> prompt and you can start using the Recovery Console. You can attempt to repair the MBR with the fixmbr command. NOTE: Some rootkits can cause fixmbr to think it worked even though it did not. I always look at the MBR partition table before running fixmbr. Gparted (described further below) makes this easy to do. If you type y then it will quickly write a new MBR to the drive. and hit enter to reboot the computer and see if it is fixed. If this does not fix it there may be deeper problems with the MBR or the problem may be further in the boot process. If your computer sees the hard drive but still does not boot, we can take a look at the MBR using a bootdisk or bootable USB (if the computer has USB booting capabilities). Lately, I’ve preferred PartedMagic for this. It is free but be sure to donate to him if his product helps you. Follow the directions there to make a boot CD. Lets take this opportunity to look at the built-in Self-Monitoring, Analysis and Reporting Technology (SMART) diagnostic report of the hard drive. After PartedMagic loads, double-click the Disk Health icon on the desktop and then double-click the icon for your hard drive and select the Attributes tab. I usually look for bad sectors “Reallocated Sector Count” represented by the raw value of attribute ID 5 (and C5 to a lesser extent). If this value is greater than 0 you may want to click on the Perform Tests tab and run the “Short Self Test” to make sure that it runs with a test result of “Completed without error”. If you see problems here, then the drive is probably going bad and you should focus on data recovery and replace it. Next we can use the Partition Editor program in Parted Magic called GParted to see if the partitions are showing up properly. 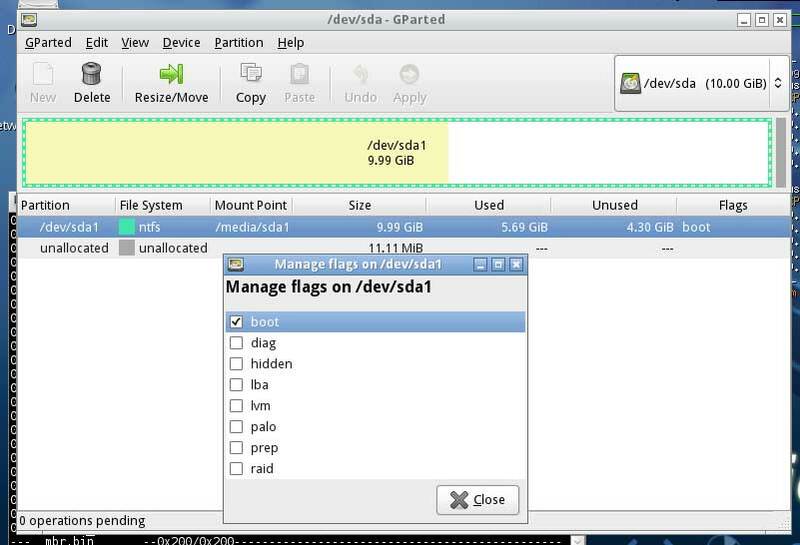 Make sure that one of the partitions has ‘boot‘ in the FLAGS column. If not, choose the partition that you want to boot from and right-click it, select Manage Flags and check the box for the Boot flag. Then click the Apply button, remove the CD and reboot to see if that fixed it. If you see anything strange here like tiny hidden bootable partitions, you should consult with a professional as this could be malware. Changing the Boot flag on partitions is relatively easy to undo but deleting a partition may make things worse. If you don’t see any partitions on your hard drive listed in the Partition Editor then you can look at the hex of your MBR at the partition table and see if something looks wrong there. In PartedMagic there is a button in the lower left corner of the screen that functions much like the START button on a Windows XP desktop so I’ll refer to it here as the START button. Here is a screenshot showing the partition table data section highlighted (and the Magic number or MBR signature 55 AA or 0xaa55 which all MBRs must have). 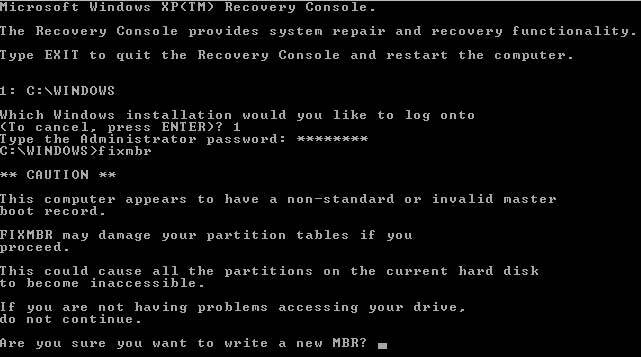 For this section lets look at an MBR with a messed up partition table. This is from the same drive as the previous picture but I’ve deleted the partition. Here it will tell you if there is an error detected for the disk. Here it will often tell you errors with the partitions (like invalid sector counts) or show bizarre partitions that may be overlapping or corrupted in the partition table. Now reboot and the system comes back like before the partition was deleted. This also works for damaged or corrupted partition tables. If you’ve gotten this far and still haven’t found the reason why your computer does not boot, then we will move on to the next step in XP’s boot process. The Bootloader to Logon. Go to Part 2 for that post. Thank you for a wonderful tutorial that actually works, I was able to revive a system for a client that had MBR 3 error and after a ton of efforts my last resort was to wipe the system and reinstall but your metthod saved the day. Thanks for a great tutorial. I did find that partedmagic is now requiring a payment of $4.99 to download it. I have absolutely no problem as I come from the 1980s shareware environment, and this way people will pay what I consider to be a nominal sum to support someone’s work! PartedMagic stopped being free back in September but the response in the FOSS community (like you) has been mostly understanding of the reasons behind it. 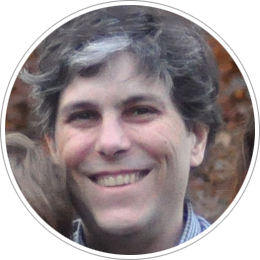 Lately, when a free version of the tools is required by someone who is not comfortable with Linux, I’ve been recommending the CloneZilla LiveCD which has TestDisk and ddrescue in it if you choose the command line when starting it. And the GParted liveCD for using GParted. I certainly would prefer people to support PartedMagic though as it is the best way for Linux novices to have access to the tools that I recommend. Salve. I apologize for bothering you . Start with the computer windows xp SP3 but I read that there is no OS and the BIOS does not see the hdd (1). I tried to replace hdd (1) with the other hdd (2) definitely working and the bios sees it, then all connections are good. The hdd (1) works because I hear the sound of the engine and the click of the head that moves, all this for 20-40 seconds and then stops by itself . This fault is after I removed the program Glaryutilities but I think I deleted something too: probably the MBR file: neither possible that this is the reason of this problem ? I connected hdd (1) externally to another computer via the USB port, but there is always the same defect: the computer does not see it and the HDD (1) motor runs for 20-40 seconds then stops. I have some data on the HDD (1) and I do not want to erase with the formatting and then the question is: how can I restore the MBR file, or other files required to restart the hdd (1) and retrieve them? Thank you in advance and I cordially greet . It sounds like the hard drive has physical damage. It should be sent to a data recovery lab for recovery. Okay,probably i messed up completely because the computer will not boot.I inserted a usb stick with a win7 32 iso and tried to repair my startup.It finds the Win7 64 installation but can’t do any more.Should i proceed with the fixboot etc. from the command prompt or make another usb with a Win7 64 iso.? Hi this is really a great tutorial and I have tried using testdisk for many times on several external drive, however, this time I accidentally rewrite the MBR on the system drive itself that result to my computer unable to its OS. however can i fix this issue, is there another I can use to boot and have the boot loader be fix? Thanks in advance. Hi this is really a great tutorial and I have tried using testdisk for many times on several external drive, however, this time I accidentally rewrite the MBR on the system drive itself that result to my computer unable to boot to its OS. Is there a way I can fix this issue, is there another tool I can use to boot and have the boot loader be fix? Thanks in advance. without success. I do not know where to go from hear? Willing to hex edit files. Need a little direction and possibly some instructions. Be sure to backup important data first. : windows no has found only 504 k of low memory. 512 k of low memory is required to run window nt. you may need to upgrade your computer or run a configuratio jnprogram provided by the manufacturer. Thanks for a well done tutorial. I ran across it after having done much of what you talked about on a drive where the the MBR got clobbered. I too am using the PartedMagic tool (same version shown in your tutorial). However using Testdisk to either copy the Backup Boot Sector over the boot sector, or to Rebuild the Boot Sector, and then write it to disk I get a Testdisk message saying “Write error: Can’t overwrite NTFS boot sector”. When I dump the boot sector it is all nulls, where the backup one loos normal. I can see & read all the other data in the NTFS partition, but without a good boot sector I can’t boot the drive. Is there a way to get the Boot Sector straightened out? Typically, that error is a sign of damage to the file system. If you can see your data in TestDisk or some other way then make a copy of it first. You will need to have enough space on another disk to copy them to. Once you’ve copied the important data, see if you can run chkdsk on the drive which may fix it or at least fix it enough for you to be able to repair the boot sector. Did you check the S.M.A.R.T. data of the drive? Maybe there are some bad sectors causing the problems. Thanks. I also ran the Spinwrite (level 5) utility twice on the the disk, and both times it reported no surface errors (I don’t often see one that clean). Spinwrite attempts to read the S.M.A R.T. Data, but reported the disk did not provide S.M.A.R.T. data, so it couldn’t evaluate it. Since Spinwrite read & writes every byte on the disk, inverting the bit pattern on one of the read/write passes (I presume that includes the bytes in the boot sector too), it makes it difficult to understand why Testdisk doesn’t seem to be able to write to the boot sector. I’ve already copied data file off to another system, so the data is mostly safe now. Guess I’ll have to find another disk to to have Testdisk backup everything, and see if I can rebuild the disk and restore the partition data from the backup, unless you’ve got other ideas. I have some old software i need to access on that disk, which is not supported on today’s Windows 10 systems, and I’m not sure I can still find the installation media to reinstall it, so I’d really like to repair this disk. Sometimes I have good luck with HDDScan http://www.hddscan.com when other tools can not see the S.M.A R.T. Data. From what you’ve seen so far I think it would be very helpful to get a look at that data before using the disk for anything else. Will give hddscan a look. Based on what I see in the Disk Health utility, I’d interpret what I see in Spinwrite as there is nothing that had produced a S.M.A.R.T. alert and not that the disk can’t report those alerts if needed. Agreed, I won’t be using the disk for anything else at this point, until I can image it to another drive (just need a suitable drive now).